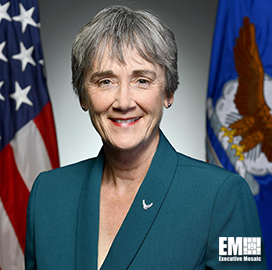 Air Force Secretary Heather Wilson has said the service plans to increase the total number of operational squadrons to 386 and add 40K more personnel by 2030 to counter potential military threats posed by Russia and China, Reuters reported Monday. That figure represents a 24 percent increase from the service’s 312 squadrons. Wilson told reporters Monday that the service would not be able to maintain its military edge in the next decade at its current size. “The Air Force is too small for what the nation is asking us to do,” she added. Wilson said she expects the service’s plan to establish a new “space force” to cost approximately $13B in the next five years, according to a report by Defense News. The report said the service would need to allocate approximately $7.2B for space force components, $2.2B for headquarters elements, $1.8B for “direct reporting units,” $595M to hire more personnel for the proposed space command and $1M to establish the new space-focused combatant command in the next five years. “To stand up a department that’s responsible for recruiting and training and planning and programming and budgeting and all of the leadership requirements that a department has, it’s a major undertaking,” Wilson said.